The government says that it is "responding positively" when criticisms are made. As a result, tens of thousands of people have had to challenge decisions in order to obtain benefits to which they are entitled. Campaigners say that the relationship between a private contractor - Atos Origin - and the Department for Work and Pensions (DWP) has often been to blame. Jim Allison, a benefits adviser based in Cumbria, came across one case in which an applicant for Disability Living Allowance had had 20 alterations made to her medical report. The corrections had the effect of invalidating her claim: only when she decided to appeal did the alterations come to light. For example, the word "unsteady" had been altered to "steady" when describing her ability to walk. In another part of the report, the doctor had originally said that she was able to walk 30 metres. The "3" had later been turned into an "8", thereby making it less likely that she would be awarded DLA. "This particular case was the worst I'd seen," said Mr Allison. "Twenty alterations were made and as a result it reversed the outcome and the lady was actually turned down." In another case, Paul Hailey, who lives near Swansea, had his Incapacity Benefit in 2004 withdrawn following a periodic check-up to determine his level of disability. 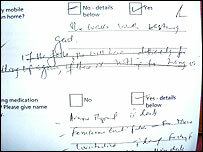 In order to improve the efficiency of the medical reporting service, a computerised questionnaire was introduced and this, according to campaigners, is producing inconsistent results. In Mr Hailey's case, the computer had assumed that he was able to watch TV for an hour, and therefore was able to sit comfortably for this period of time. The computer system inferred from this that he was able to work. 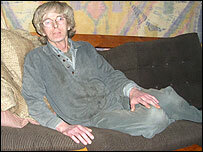 In fact, Mr Hailey has a painful back problem and has to watch TV reclining on a sofa. He subsequently appealed and had his benefits reinstated. 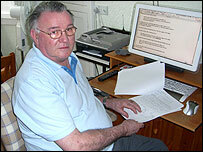 Atos Origin doctors send their reports to civil servants who make a final decision about a person's entitlement. Here again, our investigation found inconsistencies: in the case of 11-year-old identical twins with autism, one had her Disability Living Allowance uprated while her sister - who has exactly the same level of disability - was turned down. When this was pointed out to the DWP, the twin who had initially received the increase had it withdrawn. The twins' mother took the case to appeal and both children now receive the higher rate. Disability Minister Anne McGuire said the overwhelming majority of claims were dealt with satisfactorily. But she said the government was always keen to improve when bad practice came to light. "I'm not immune to the fact that there may be criticisms," she said. "What I think ought to be recognised is that we are responding positively where those criticisms are made." The BBC approached Atos Origin for a response to the criticisms of its medical reporting but the company has declined to comment.